It takes a lot to stand out in the ultra-competitive SUV market. American drivers expect a vehicle to wear many hats and offer modern technology and features. It has to maintain comfort after hours on the road, and it must keep its passengers safe. Proficient multitasking is absolutely required, and no other midsize SUV does it all like the Hyundai Santa Fe. The 2019 Santa Fe surpasses these expectations with exceptional value, delivering state-of-the-art technology, convenience, and safety all backed by Hyundai’s lauded warranty. Front-wheel-drive comes standard across all trims except for the Limited Ultimate, which has all-wheel-drive. The SEL comes with a bundle of added features like satellite radio and surround-sound. The Limited sports a fine leather interior, and the Ultimate is loaded with convenient tech like rain-sensing windshield wipers. If the Santa Fe sounds like the SUV for you, come see it for yourself at Sycamore Hyundai. Visit our dealership today to test drive the 2019 Santa Fe and talk with us about its features and impressive warranty. The two-row Santa Fe comfortably seats five, having three tether anchors to secure car seats. The interior styling is modern and appointed with high-quality materials. Noise-reducing insulation keeps the cabin quiet, and the overall ride is enjoyably smooth. Things have never looked brighter as the 2019 Santa Fe now sports a gleaming chrome grille and new LED lights. For the two-row Santa Fe, drivers have two 4-cylinder engines to choose from. The standard issue puts out 185 horsepower and the available turbocharged option produces 235 horsepower. Both of these pair with a new, smooth-shifting eight-speed automatic transmission and provide some of the best gas mileage in its class. The two-row build can tow up to 2,000 pounds. The available HTRAC all-wheel-drive system is prepared for a variety of road and weather conditions. With keen control over torque, engine power, and braking, it maintains sure handling and road grip in any scenario. 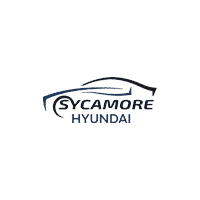 Whether it’s the reliable Santa Fe or any other Hyundai car, truck, or SUV, we’re sure to have the vehicle you need at Sycamore Hyundai. Our lot has new and pre-owned Hyundai vehicles across a diverse range of price points, models, and trim levels. We hope you’ll come to our dealership or look up our stock online to explore at your convenience. Our trained team of experts will be ready to help you with spectacular customer service and expertise. We’re certain that you’ll find the Hyundai that’s right for you. While you’re talking with us, remember to ask about our special offers, financing plans, and other deals.